We’re all dying to glow after Rihanna dropped the mega stunning (and expensive) Body Lava! But if you’re probably not willing to drop 60 bones to glow up this summer. I’m not either. Just yet. So I’m over here enjoying the new City Color Cosmetics Photo Chic Highlight Dropsfor a fraction of the price! Great for Face and Body! These babies can be used on your eyes, lips, cheeks and even your body. They’re formulated with Vitamin E for light hydration and silky application. The Photo Chic Highlight Drops practically melts into skin. Making it a wonderful addition to moisturizer, foundation and lotion for a customized all over glow. I was surprised at how much I liked these! 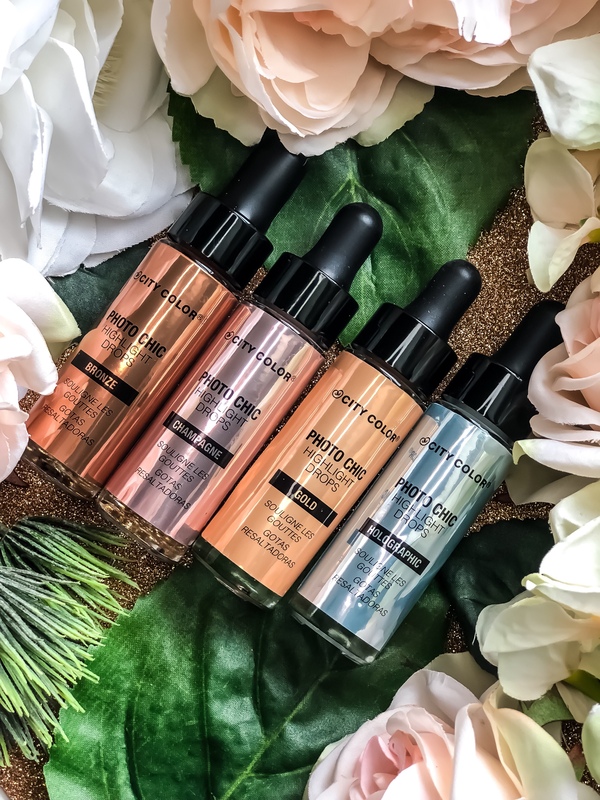 The Photo Chic Highlight Drops have a very fluid consistency that absorbs quickly and blends incredibly well. It doesn’t ball or flake up. Nor is it loaded with a ton of glitter. The Photo Chic Highlight Drops sport a more subtle glow that’s easily buildable, of course. I like to add at least 2 drops if I’m mixing them into my foundation. Otherwise, one drop is just fine to wear alone. Or underneath a powder highlighter if you’re bold like that, sis. Once the Photo Chic Highlight Drops set into place it’s smooth sailing for the rest of the day. The formula practically melts into skin so it doesn’t take long to set at all. Meaning you get all day wear with minimal fading for just $8. The best part? It’s loaded with skin softening Vitamin E so it won’t put your pores on blast if you have textured skin. The City Color Cosmetics Photo Chic Highlight Drops are truly a steal for just $7.99! They’re beautiful face and body highlighters that are super easy to use and quite flattering on all skin tones. I highly recommend checking them out!